This warm, lethal drink will definitely bring a rosy glow to your cheeks. Glögg is best enjoyed while sitting down, so proceed with caution. What exactly is Glögg?? Glögg pronounced [GLUHG; GLOEG] is especially popular during Advent. This Swedish spiced-wine punch gets its punch from the addition of Aquavit or Brandy. 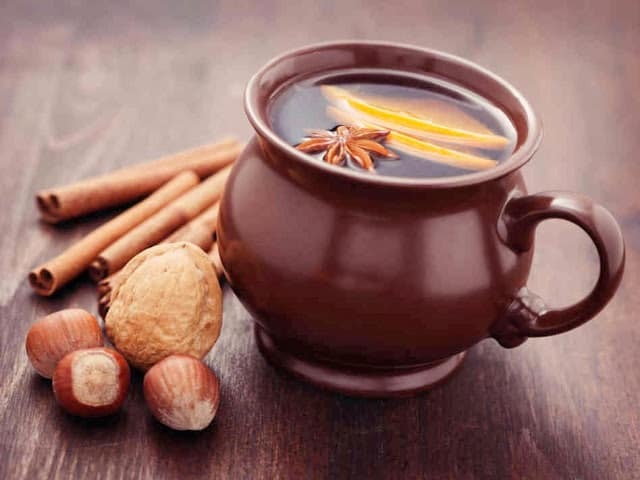 To take the chill off cold winter nights, Glögg is served hot in mugs with almonds and raisins added to each cup. Aquavit; akvakit [AHK-wuh-veet] is a strong colorless Scandinavian liquor distilled from grain or potatoes and flavored with caraway seed. It is served icy cold and drunk in a single gulp. Years ago, I worked with a proud Danish Woman who filled me in on the “spirits” and “cultures” from her native homeland Denmark. I enjoyed listening to the stories she told me about growing up in Denmark and then her move to the US. In the late 60’s, Lis came to the US with her new husband when she was in her early twenties. They settled in a small farm community called Greenville WI. Lis didn’t speak a word of English and her husband, spoke very little. She often told me how difficult is was, living in a rural community, having no friends and family near-by. She said the isolation was more difficult than anything else. Over the years, Lis and her husband had a daughter and made a life for themselves in Greenville WI, which over the years has evolved into a thriving community. Kaj worked as a draftsman until his retirement a few years ago and I met Lis while we both worked at the Mole Hole, some twenty years ago. They recently celebrated their 50th Wedding Anniversary and still live in the same house they bought so many years ago. Let a warm mug of Glögg warm you up this Holiday season. My Danish friend Lis was right, sipping a mug of Glögg will warm you up, all the way down to your toes. Mugs of hot Glogg will warm you up all the way down to your toes. Toast almonds in a skillet for 2 to 3 minutes. Set aside. Combine spices and orange zest in a nylon bag or cheesecloth. Tie bag or cheesecloth closed. Put the bag, half the wine and raisins in a saucepan and simmer 20 minutes. Do Not Boil. Add remaining wine and almonds. In s separate saucepan, heat 1/3 of the brandy, vodka or aquavit, pour in the sugar and light with a match, when sugar is melted, cover pan to extinguish the flame, then add the remaining liquor and add the brandy, vodka or aquavit mixture, to the wine and spice mixture.